Stevenage were the guests at Adams Park for a League Two match against Wycombe Wanderers on Saturday 5th May 2018. Wycombe may already be assured of automatic promotion however this was their last League Two game of the 2017/18 season. The Chairboys started the match in a very positive manner, in the ninth minute Paris Cowan-Hall came close to scoring but his shot missed to the left of the goal. The fifteenth minute saw a corner from which Adam El-Abdnearly nearly give Wycombe the lead however the ball went to the left of the Stevenage goal. Maintaining the pressure Wycombe scored their first goal of the match in the nineteenth minute as Matt Bloomfield shot from the centre of the box with the ball finding the bottom left corner of the net. Despite Wycombe’s best attempts they were unable to capitalise on their one goal lead and the match ended with victory to Wycombe by a solitary goal. Wycombe managed 55% possession during the match and placed two of their twelve attempts on the Stevenage goal on target. Stevenage could only manage to get one of their three shots on the Wycombe goal on target. The game saw twenty four fouls, eleven by Wycombe and thirteen by Stevenage. Wycombe end the 2017/18 season in third place in League Two with eighty four points from forty six games. 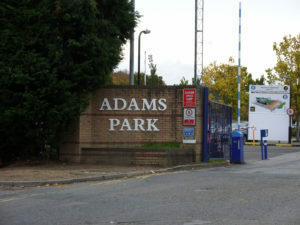 The attendance at Adams Park was 8,802.